(2, 3, 7, Niblick). All 4 are left handed. TheNiblick is a:Hand Forged Champion Special. Antique old wooden shafted right handed smooth faced brass putter. Nice solid club. Hosel join is flush and tight. Appears to have original steel or iron hosel pin. Shaft remains straight and has the 'Auchterlonie' stampings. The head as shown in photo's is raw/never painted. Antique old wooden shafted mashie niblick with nice sole flange. Hand forged British club by J, B. Halley & Co. with their 'Pyramid' cleekmark. Dot faced scoring showing no nicks. Leading edge shows a few scant play nicks. By (BRIGG) 1909. "Stunning Brigg Hallmarked Golf waking stick". "LONDON 1909". 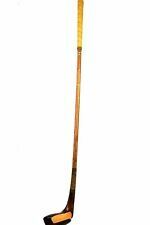 The total length of the walking cane 35.1/2" or 90 cm. This Golf stick is in good condition,one for the connoisseur. Rare Masters 2 1/2 persimmon wood, Neverbhit. Excellent condition Cleveland Classic designed by Ben Crenshaw putter. Leather Cleveland grip and mint shaft band with new Cleveland head cover. With original braces. - No size label fits as a 32 to 34 waist and a 19 leg. inside leg:- 19. waist flat:- 17 1/2". Material: All Cowhide Leather. One pocket in front and a leather strap to hang it on your shoulder. Capacity: It can easily handle 6-10 clubs. Color: Tan Brown. Note that our products are fully checked before they are sent to you. You're looking at a TaylorMade RBZ Rocketballz 3 iron. It has a stock RBZ 65g M senior flex graphite shaft. 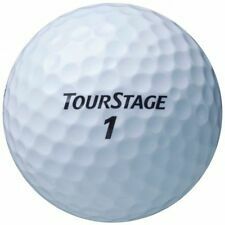 It has a Golf Pride standard size grip in good condition. It is 40" long. The club is in overall very good condition. Old golf bag in poor condition. May be great for decor. Thistle Driver from about 1920 for collecting, or for use by a female hickory player. 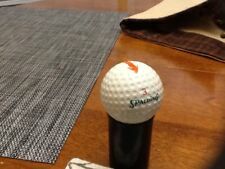 Spalding "Thistle" Driver. Suede leader grip. Here is a nice, Tom Morris, Carnoustie Scotland, Imperial putter.The marking on the head are clear and visible. The club has a scored line face pattern. The marking on the head are clear and visible. Lot of 10 hickory golf clubs - 1 is LH. Die original Golfschläger Leuchte von Leola / Deutschland aus dem Jahr 1988. Guter bis sehr guter gebrauchter Zustand. Leichte Gebrauchsspuren sind vorhanden. Geo Laws Syracuse, NY smooth face mashie. 38" hickory shaft and new suede leather grip. Looks like a real good player for your gutty era events. Rare Macgregor 5 wood, MO5 model. New Macgregor grip. Older refinish, not much play on it. Vtg AH Scott Howker Hickory Shaft Wood Scotland Unusual Sole Plate Rare 44"
Neues AngebotMacGregor PT4W Velocitized Wood Set (1,2,3,4,5) RH, vintage, extremely rare! Back when these were made rarely did you see a # 5 wood. The set shows nicks and scratches as can be seen in the pictures. They have the originalPropel shafts andPropel 4 shaft bands. The set is:right hand. This is a set of Riviera golf clubs with a 1-3-4 woods that are precision balanced and blonde wood with black inlays. The irons are 3-4-5-6-7-8 plus a dual wedge that are all matching with identical serial #'s. Uhr funktioniert und hat ein recht leises Laufwerk. Nice refinished Walter Hagen putter. Putter head has been refinished by an experienced club maker. Color: Tan | Material: All Cowhide Leather. ORIGINAL TAN 100% REAL LEATHER TUBE GOLF CLUB CARRYING BAG RETRO STYLE 2 POCKETS. A leather strap to hang it on your shoulder. Two pockets in front regular.Size. Antique Forgan St Andrews Hand Forged 4 Iron Mens RH Hickory Golf Club. Will have wear and defects from age. Thanks! Not too many of the around. The putter is:right hand. It has a pistol style rubber grip that is dried out. It has the original shaft band that is worn and hard to read. The putter is about:33 3/4" long. Macgregor (Dayton, O.) Hickory Shaft Mid Iron (2) - Oval Cloverleaf Logo, DOTS ! A really nice hickory shafted, "Duralite", stainless steel, Macgregor mid iron, #2. 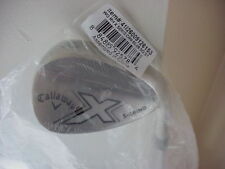 The clubface is in excellent condition and has the oval "Cloverleaf" logo (pics). This set represents very little play. Very solid set with no visible neck cracks. All Stamping are in great condition. The Beautiful Mahogany finish brings out the very nice Grain in this set. Not Many 663T Sets in this Condition. MADE BY "THE SILVERTOWN CO." c.LATE 1930s. SILVER KING HIGH VELOCITY GOLF BALL BOX-12 BOX. Lot of 10 hickory golf clubs. SEZZATINI of Golf. Tablett massiv Holz . Verkauf wie auf dem Foto! The bottom of the shaft has been freshly bound with authentic golf club binding twine. In excellent condition. 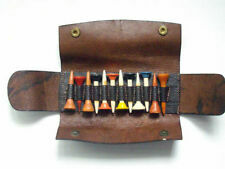 The original “traditional” leather strip “wrap around” grip has been fitted – the grip has been freshly bound, top and bottom, with authentic golf club binding twine. Lot of 6 golf balls from 1900s to 1920's. Antique Golf Balls. Rubber Core. Condition: Good for their age. The face has the Gary Player autograph, but we don't know if it is authentic. The putter is:right hand. It has the original Gary playerputter grip that is still playable. The putter is about:35" long. Irons include Spalding Dundee mid-iron, Wright & Ditson St Andrews mashie, Winner niblick and Wright & Ditson Bee-Line putter. 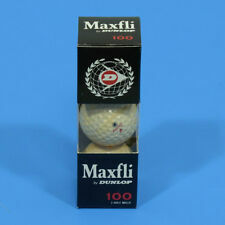 Dozen box w/ 7 vintage LOU FERRIS LIQUID CENTER golf balls. Vintage Ram 3D Pro Golf Balls, Ramlon Plus Cover - 1 Dozen New In Original Box! !